Success includes more than just material wealth, and being successful is more than what we do for a living. 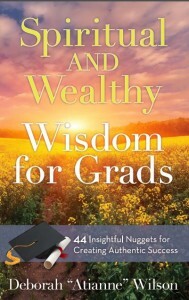 Spiritual AND Wealthy Wisdom for Grads offers universal and practical wisdom to empower you beyond graduation, supporting you with life-long inspiration, so you can create the authentic success that is already uniquely within you and achieve more happiness in every area of your life. Deborah “Atianne” Wilson, author of It’s OK to be Spiritual AND Wealthy, inspires her international audiences and clientele to effectively create happiness and freedom in all areas of their lives. Deborah reminds us of our Divinity, revealing to us that success comes from staying conscious of the choices we make, the actions we take and our willingness to stay open to unlimited possibilities.